Make the fall season extra special with these delicious Pumpkin Cinnamon Rolls. Classic cinnamon rolls get a fall twist with pumpkin puree and fall spices. These extra gooey pumpkin cinnamon rolls are my most favorite breakfast indulgence! Before I start to add my Christmas cookies and holiday breads, there is one more pumpkin recipe that has to be shared here. You should consider making these for Christmas morning. You could prep the rolls the night before leave in the refrigerator overnight. This is what I mean about the second rise. This is how the rolls will look when they are ready to place in the oven and bake. The cinnamon brown sugar filling paired with the pumpkin dough smells absolutely divine while baking! Oh, and did I mention the pumpkin glaze. Incredible! Look at these rolls! Seriously, it is worth all the effort to have these incredible rolls waiting for you. I will wake up any day at 5AM to have my own ooey, gooey and super soft and fluffy pumpkin cinnamon rolls! Look at these beautiful soft rolls beckoning you to pull them apart and dig in. I liked my rolls just as they were right out of the oven. I’m not too crazy about overly sweet treats. My dad happened to come by as they were just baked and he took a couple home. I surprised my neighbors with a plate of these and they loved the pumpkin glaze. In deciding on a recipe to try with the yeast, I was brainstorming all over the place with different breads and rolls. Since it is officially fall and more importantly, pumpkin baking season, I knew exactly what to bake: Pumpkin Cinnamon Rolls. Now here is why I don’t make cinnamon rolls more often. If I would want to have them ready for breakfast on a weekend morning, I would have to wake up at 5 AM. I decided to make the dough on the evening before I would bake the next the day. I prepped my dough and let it rise. After it rose, I made my rolls and put them in my prepped pans. I put the pan with the rolls in the fridge over night. The next morning, I took out the pans to let them rise before baking. And boy, did the dough rise! I was afraid it wouldn’t be the same from rising in the fridge. I fit them into a square baking pan and even had some stragglers that I put into muffin tins. I let those rise for about an hour and man, pumpkin cinnamon dough delight! Red Star has a fantastic yeast called PLATINUM Superior Baking Yeast that could help ease some of your yeast fears. As an avid bread baker, I couldn’t wait to dig into my new yeast packets to see the results for myself. With the advent of fall, Pumpkin Cinnamon Rolls was an obvious first recipe to try with their new yeast. Red Star Yeast helps making homemade bread a little more easy and enjoyable. Just looking at these gorgeous pumpkin cinnamon rolls again today, I am reminded about why I’m so in love with baking my own bread. The smell of pumpkin and fall spices baking on a Sunday morning in magical fluffy buns is like paradise. After preparing the dough and allowing to rise, you cut the dough into the pieces and place in the pan. You have to wait for them to rise again. That is a key step in making the fluffiest pumpkin cinnamon rolls…the second rise!! Red Star’s PLATINUM Superior Yeast is a premium instant yeast blended with dough improvers commonly used by professional bakers that will make your dough so forgiving that you will never be intimidated by yeast again! I was intrigued with trying Platinum also because of the fact that it is very effective in making whole grain recipes light and larger in volume. You know that sometimes when baking a whole grain recipe it could be a little more solid-this is no longer a baking issue using Platinum. I was extremely satisfied with the result. • Simple to use. So forgiving it takes the intimidation out of baking with yeast! • Strengthens the dough and improves dough tolerance to variations in kneading, rising, and flour quality. • Produces consistent baked products home bakers will enjoy. • Increases the amount of leavening retained in the dough. • Decreases the risk of the dough collapsing after proofing or during baking. • Increases oven ‘spring’ and the finished volume of the baked product. • Works great in any bread recipe, but is particularly effective in producing healthy whole grain and sweet breads that are light, airy, and larger in volume. 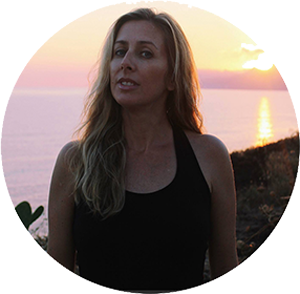 Disclosure: I was compensated by Red Star Yeast for writing this post. My opinion’s are entirely my own. I was already a huge fan of Red Star Yeast, so I couldn’t wait to try their Platinum yeast! Post originally posted in 2012. Updated photos. In a mixing bowl (I used my stand mixer) sprinkle the yeast over the warm water. Let stand until foamy; about 5 minutes. Beat in on medium-low speed the milk, egg, pumpkin puree, melted butter and brown sugar until combined. Gradually add the flours and salt, scraping down side of bowl, until a soft dough forms. I ended up adding a little extra flour until I had a workable dough. Remove the dough from the mixer and knead until smooth (add more flour if too sticky. Knead until smooth. The dough will be a little more sticky. That’s fine. You just want the dough to hold its shape). Grease a large bowl. Place the dough in the bowl. Cover with plastic wrap and place in a warm spot until doubled in size, about 1 1/2 hour (until puffy-not necessarily doubled in bulk). In a small bowl, whisk together the sugar and spices; set aside. 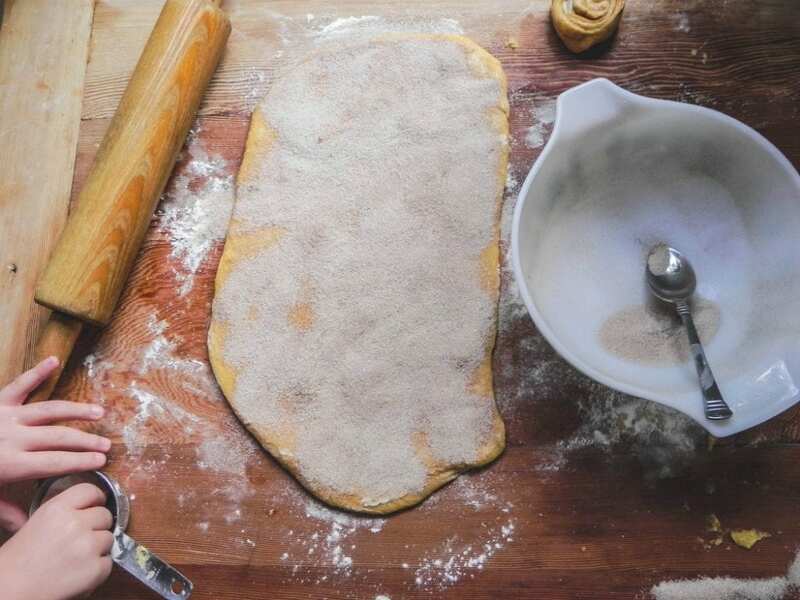 Gently deflate the dough, and transfer it to a lightly floured work surface. Cut the dough in half. 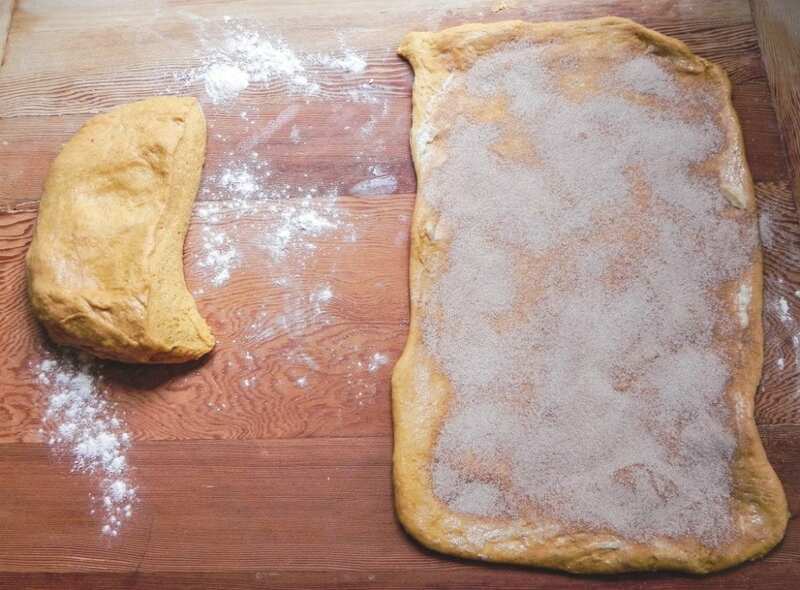 Roll the dough out into a rectangle, approximately 12×16 inches. Spread the butter all over. Sprinkle on the cinnamon sugar. Place the slices in a greased 9×13 pan (this was a 9x9 pan) or two 9 inch cake. Cover with clean kitchen towel and let sit in a draft-free spot spot until buns double in size, about 30 to 45 minutes. Heat oven to 350°F. Uncover pans and bake buns until they are golden-brown and bubbly, 30 to 40 minutes. In a small bowl, whisk together the glaze ingredients. Add more milk as necessary to make a smooth glaze. Invert buns to a serving platter. To make the night before: You can prepare the rolls and place them in the greased pans and leave overnight in the refrigerator. The next morning, remove the pans from the refrigerator and let the rolls rise. Bake at 350 F for 30-40 minutes. Gorgeous rolls, Lora! I'd love one right now! The glaze is positively divine :). I need one of these right now, with a cup of coffee for the perfect afternoon treat!!! They look so delicious, Lora! Like Red Star/Cake Duchess on FB. The first thing I'd bake with Red Star Yeast Platinum? 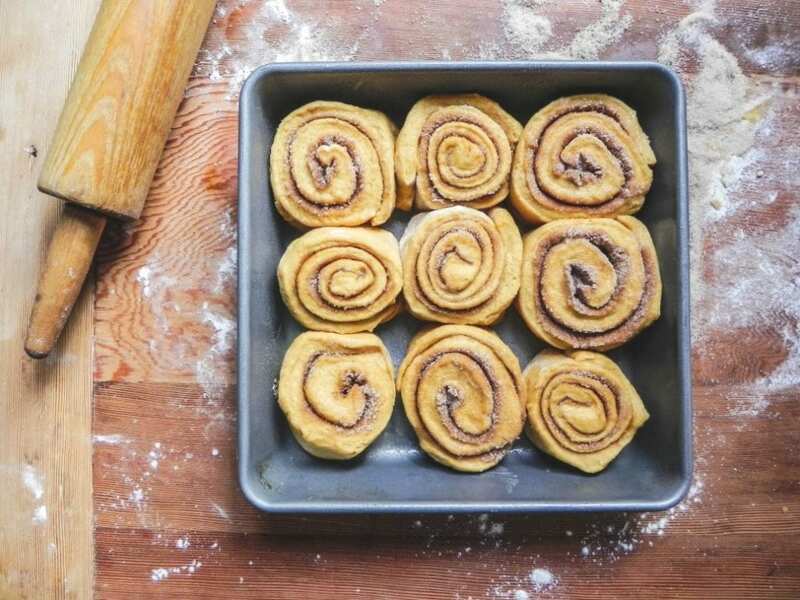 Bread or these cinnamon rolls! 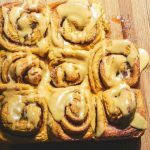 Bonus: The first thing I'm going to make with Red Star Yeast is these pumpkin cinnamon rolls – without a doubt!!! I've like you and Red Star Yeast on Facebook. I'm following you and Red Star Yeast on Pinterest. Bonus, I can't wait to make your Pumpkin Cinnamon Rolls with the new Platinum Yeast. They sound yummy! these look amazing… bookmarking to make, immediately! these look incredible Lora. Love!! I think I can smell them from here. Bonus: I would either make these cinnamon rolls or English muffin toasting bread. I wonder if there will be a day when a batch of glazed cinnamon rolls doesn´t capture my attention. The pics are gorgeous Lora! Makes me want to bake right now. The first thing I would make is whole wheat bread. I love making fresh bread! I will try next week-end!!! these look delicious! I love the addition of pumpkin! Following Red Star on Pinterest. If I had the Platinum yeast I would make my Kaiser rolls. I can't wait to make cinnamon raisin bread with the Platinum Yeast. I have seen all the bloggers talking about it and I cannot wait to try it! What a delightful blog you have! Just discovered you via Red Star. So very nice to meet you. 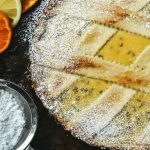 I am already a follower of Red Star and am now following Cake Duchess on Facebook! I am now following both Red Star and CAke Duchess on Pinterest. Don't you just LOVE Pinterest? It's like have a new magazine to look at every single day and all geared towards the things you love most. Can't wait to check out all of your boards!! I have to admit that I'm not on twitter that much, but I have signed up to follow both Red Star and Cake Duchess on Twitter! The first thing that I would make with the yeast is cinnamon rolls! I like red star on fb. 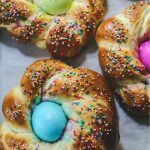 Not entering the giveaway but just dropping by to say how dreamy these seasonal cinnabuns look. I just started making them in the last year and they've been a great success with S and his buddies! 🙂 Looks absolutely delicious! The first thing I would make with the yeast would be these cinnamon rolls! I must make these soon, I know I would adore them but it may be dangerous to have the pan around. Yep the first thing I would make would be these pumpkin cinnamon rolls!! I follow you on pinterest! in fact I may be stalking you lol! I followed red star on pinterest! These rolls are over the top delicious looking and I love the pumpkin, oh and that glaze…. Lora, these look totally decadent! 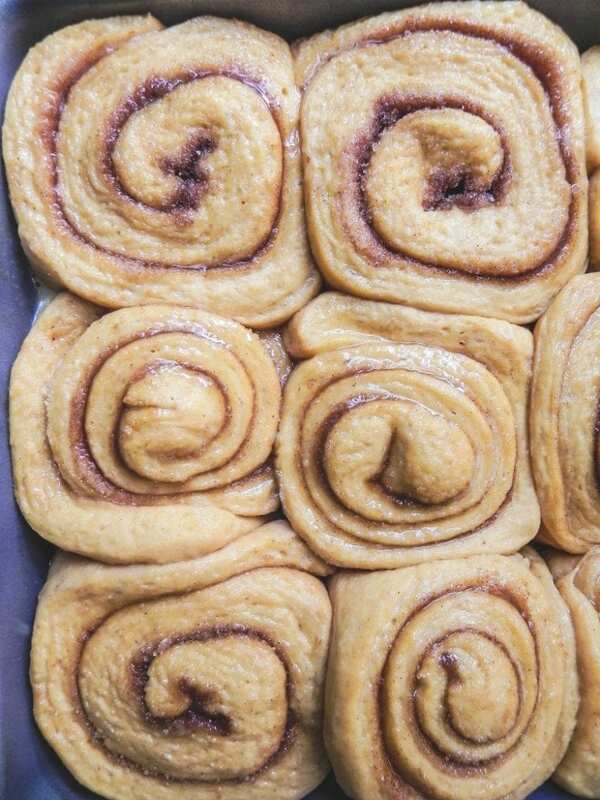 I want to bake these cinnamon rolls! I need this deliciousness in my life. Yummy rolls! 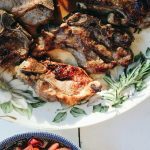 I think I would likely make this recipe if I won! It looks so good and combines so many things I love! Liked on Facebook, tweeted it (sharksgirl213) and can't wait to make these rolls. I have been in the mood for cinnamon raisin bread for a nice long while now. I liked you both on facebook & pinterest. Really excited about these rolls! Making them for a baptism this weekend. Thanks! Liked you on both facebook & pinterest. Love the rolls! Going to make them this weekend for a family baptism. thanks! I wish Red Star would sell to Australia! These pumpkin rolls look fantastic. Those rolls look fantastic! I love the tip about prepping the night before, then baking them in the morning. Thanks for sharing your recipe! I just liked your post about Homemade Twix Bars on FB (I already liked the page itself). 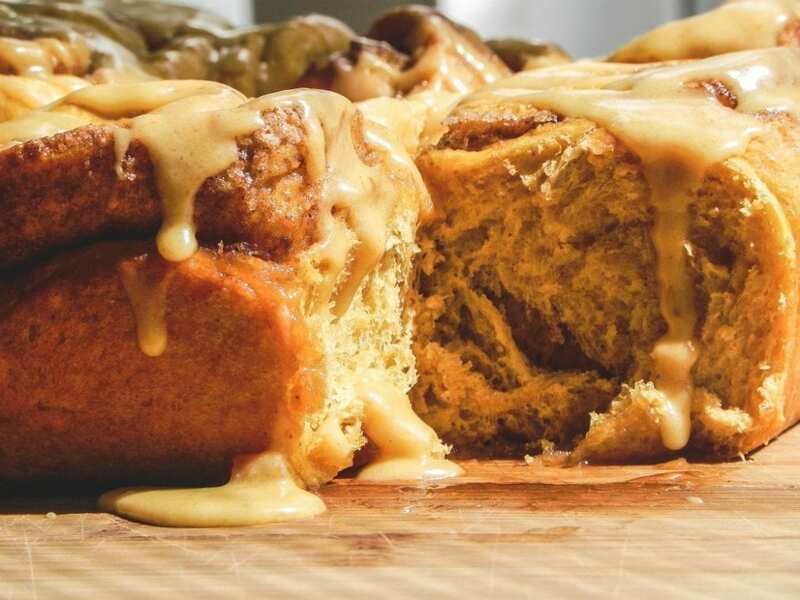 If I win the giveaway, I'm going to make these pumpkin cinnamon rolls. They look amazing! Oh my – what plump rolls you have! Wish I had one right now, Lora 🙂 The pumpkin glaze sounds absolutely divine. 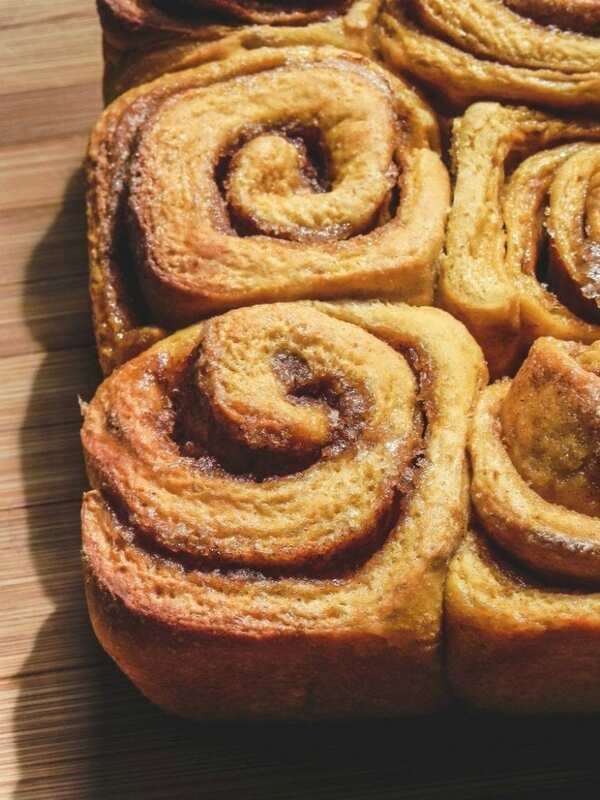 These pumpkin cinnamon rolls look fantastic! I bought my first pumpkin this past weekend and have so many ideas what to use it for. Your cinnamon rolls look delicious Lora! I'd definitely like to make your pumpkin cinnamon rolls if I won! Lora, these rolls look absolutely mouthwateringly good. I'm imagining the mingling of cinnamon and pumpkin as I bite into that soft roll. I'd get up at 5 am to make this but probably better to follow your lead and prep the night before. It would be worth it! The first thing I'm going to make with Red Star Platinum are these delish Cinnamon Rolls! Thank you so much for the sweet comment you left on my blog! Totally made my day. hemmmm…i like bread very much and i will try with your recipe, look so yummy! My mouth is officially watering! Love these rolls. The pumpkin just puts them over the top! Need to make soon!!! I "liked" Cake Duchess on Facebook! The first thing I'd like to bake with Red Star Yeast Platinum is my favourite dinner rolls, made with whole wheat and honey. Love cinnamon rolls! I followed you on pinterest and liked you a Facebook. Im following you on twitter and pinterest and I tweeted as well. Thank you so much for this recipe! I have Liked Red Star for a while now. I just started following Red Star on twitter. I am now following Red Star on Pinterest. 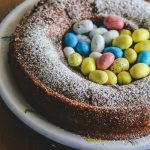 I am now following on Cake Duchess Pinterest. Also liked Cake Duchess on Facebook. Liked Red Start and Cake Duchess on Facebook. I think this Pumpkin Cinnamon Rolls would be the first thing bake with red star. 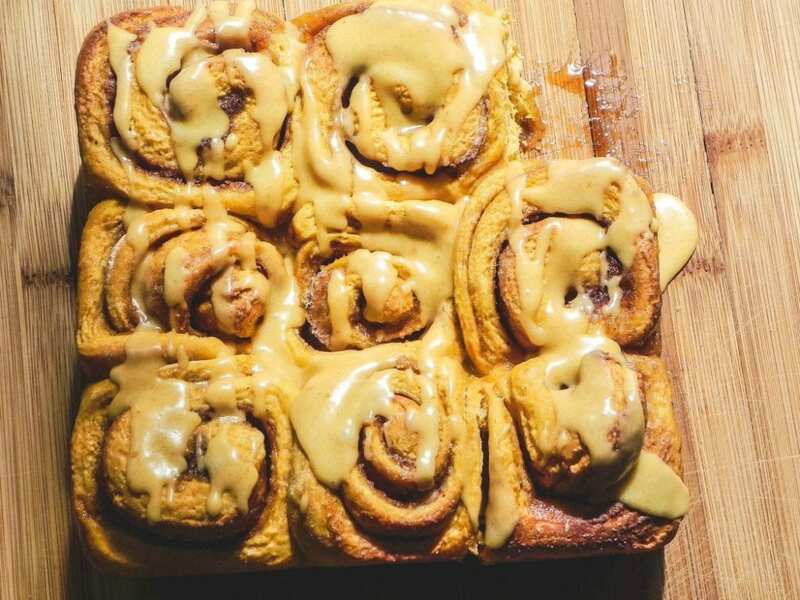 I would make these pumpkin cinnamon rolls. I Like Red Star and Cake Duchess on Facebook. I Follow Red Star and Cake Duchess on Twitter. I Follow Red Star and Cake Duchess on Pinterest. I would love to bake some pecan rolls with the Red Star Platinum Yeast. I am now following both on Pinterest. I've liked Platinum and Cake Duchess on FB! I want to win!! I liked both Red Star and Cake Duchess on Facebook. Can't wait to make these pumpkin rolls! I'm following Red Star on Pinterest. The first thing I want to try making with Red Star Platinum is my cool-rise caramel rolls.